I almost had a heart attack the first time I saw her do it. I thought for sure they’d fire her. Not that it was that kind of place, you understand – I’d later see the day manager take to the office door with a tomahawk when $400 went missing. But it was only my second week there, and it shocked the hell out of me. I was wiping down the bar at the time. The dart board was behind me, and I’d moved out of her way as she wrenched a spike out of the cork. 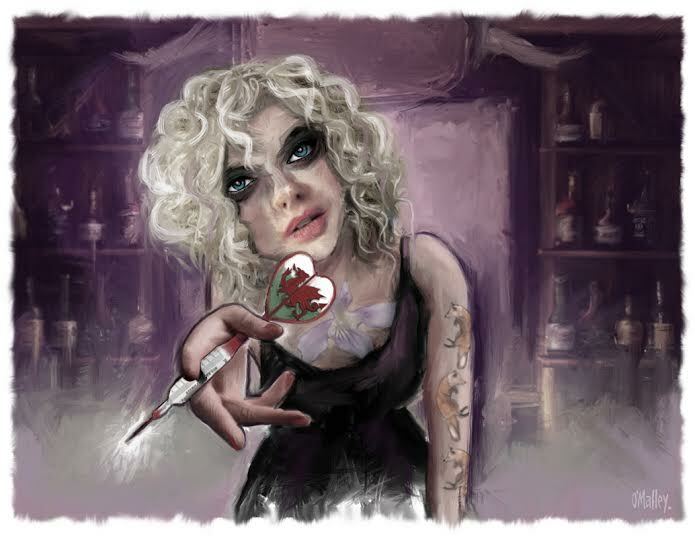 She’d turned, blonde curls flying, and held the dart up in front of her. I’d watched her squint, no more than a second, and then the steel tip was flying through the bar towards Johnson, one of the regulars. I couldn’t have stopped it if I’d tried. The dart slid effortlessly into the sleeve of his coat. It pinned him to the bar, with not a millimetre to spare. I think he was even more surprised than me. ‘You!’ Her finger, pointing at his face. I lost count of the times I saw her do her party trick over the next nine months. It always made me jump. She never paused for more than a second, never hit a customer. In any other bar there’d be complaints, or health and safety talks. But in ours, well, people pretty much knew what they were getting when they walked in the battered door. She scared the hell out of me. She also turned me on so much I could barely share a shift with her. We called her Guinevere. She had a mop of pale hair that corkscrewed out in all directions, and she always lined her eyes with black, even when she worked the Sunday lunch shift. Her real name was Welsh, but the night manager, McGuinness, couldn’t pronounce it. He was the first to call her Guinevere; he told us it was the only Welsh name he could say. When summer came and clothing shrank, I got to see her tattoos. She had a line of foxes scampering up her left arm, the top one snuffling its nose under her triceps. It was her chest tattoo I loved the most though; a violet in full bloom, its petals curling just over the top of her collarbone. I didn’t find it easy to talk to her, but I did ask her about it once. I’d had two pints for my knock-off and was kicking my legs on the bar stool to Iggy and the Stooges. She told me it was an early dog violet, a Welsh flower, and laughed when I tried to copy her pronunciation in the language. Crinylls. Her small red mouth, opening for the double l. I asked if the language was important to her and she smiled and said softly, ‘It is to my Da.’ Crinylls. She poured me a third pint as I kept rolling the word around in my mouth. I never got it right, but it made her laugh, and that was good enough for me. We’d never met anyone Welsh before. When she lost her temper with the drunks the words would fly sharper than the darts, curses we couldn’t understand but cringed at anyway. I never wanted them hurled my way, that much I knew. She had a dark sense of humour and even darker moods that could clear the bar. Sometimes she’d work a whole shift in near silence, pursing those red lips as she cleaned the glasses. I never knew what to say to her then. I’d have liked to have placed my hand on her arm, just a touch to let her know I understood. I didn’t, though. When I thought about it later I realised I’d never touched her at all, not once. When the phone call came, McGuinness took it. He came out of the office pale and had to steady himself on the edge of the bar. All we could say was ‘Who?’ Everyone knows that expression, even if they’ve only seen it once. His voice was so low I could barely hear it when he said her name. We tried to put together the whole story but it was like a jigsaw puzzle with the edges of the pieces snapped off: how long she’d been using, who knew and who didn’t. The piece that no-one wanted to pick up was whether it was an accident. No, we left that piece of the jigsaw still in the box, its edges untouched. When her Da came to get her belongings, the bar fell quiet. McGuinness brought out her army boots, and the books she’d had lined up in the break room. I poured him a whiskey andtold him how sorry I was. It seemed a useless thing to say, but I meant it. His pale blue eyes were so much like hers. I wanted to ask whether she was a boisterous child, if she’d always loved to read. But all my words dried up when I realised I didn’t even know her real name. I couldn’t call her Guinevere with her things in a bag between her dad’s feet on the sticky carpet. I couldn’t ask anything after that. I watched him carry the bag towards the door with its handles balled up in his fist. I watched him and I thought, I should have touched her. On one of her silent days I should have been brave and placed my hand on her arm, briefly and lightly, but a touch just the same. I should have reached for a fox on her arm and just for a moment, placed my hand on a tuft of red fur, or a dark little nose.